Some of us loved it, some loathed it, and many people around the world still fight for the right to access it — school is a universal experience that can both liberate and oppress. The ability and desire for all people to have access to basic education is one of the most outstanding evolutions of human society, allowing us to progress over the last few thousand years to expand the potential of our entire species and support more equitable access to opportunities around the world. Yet, the standard dominant model of education in established and increasingly emerging economies focuses on a reductive and rigid approach to building knowledge, enforcing conformity of the mind and often dulling curiosity, because at its core, it is designed to reinforce the status quo of the day. This is not new. The history of education over the past few thousand years shows that it was built from the beginning as a system to reinforce hierarchy, status, and obedience. 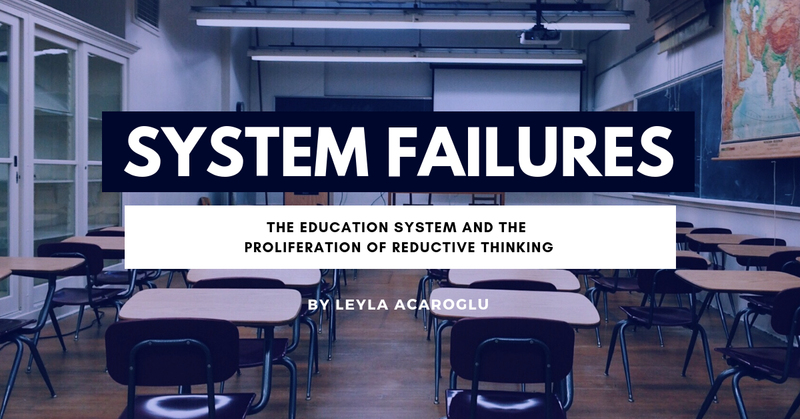 In this series of essays on systems failures, I have been exploring, from a systems perspective, the designed-in limitations of big structural systems. I’ve been delving into how they have evolved to result in wider global impacts and looking at the options for redesigning them to support positive change. In this article, I am looking at the one big system that nearly everyone reading this will have been through: the education system, otherwise known as schooling. To start with, let’s establish that learning and schooling are two very different things. The lessons needed for life are often not taught in schools (for example, no instructions on taxation or the banking system, two fundamental systems that all adults have to participate in). For many, school was more of a prison where you are taught how to think, how to behave, and how to function within a rigid, bell-ridden system that was designed to prepare young minds for the workforce through the standard technique of memorizing and regurgitating information in a test-based environment. In order to succeed in this mandatory system, we all have to learn how to think about complex phenomena in the world in constricted, reductive, linear, and siloed ways. Everything is put in its box, science over here and language over there. This helps us learn how to break the world down into individual and manageable parts so that we can then put them together in an ordered way and conform to the pre-established system of the day. As a result, for many people, schools do a massive disservice — rebels drop out, creatives fail, people are bullied for ‘not fitting in’, and all the non-linear learners struggle to get through. How has it come to be that global education systems have become structured to enforce conformity and reductive thinking? In order to maintain a linear economic system of production, extraction, and waste that devalues inputs and takes limited responsibility for outputs, you have to reinforce these ‘devalues’ in society, and you do this by making young people conform through educative structures that perpetuate the linear system. As a result, school often forms oppression, rather than liberation, of the mind. This is not a new invention — humans have been using schooling as a way of enforcing the dominant ideas of the day for a very, very long time. Early on in the human experience, children learned what they needed in order to become effective adults through the socially-learned tools of the group, from hunting and gathering to weapon making and finding life-sustaining resources (such as water) through story lines. Around 4000 years ago, schools started to emerge in the ancient societies; as early as 3000 BC, the Mesopotamians and Egyptians created structured education for the advancement of society with the intent to provide moral teachings and religious instruction (mainly to boys). Once the knowledge transfer tool of writing was developed, teaching could happen in entirely new ways, and thus, started to evolve around the world. The Ancient Greeks needed to teach their young how to read, write, and prepare as citizen-soldiers (specifically in Sparta), or to become well-skilled in the arts (in more relaxed Athens). Then, the Roman Empire adapted the Greeks’ method of schooling to prepare young men (predominantly wealthy ones) for public life, focusing on reading, writing, and public discourse. After the Roman Empire fell, the strict form of education became the model of European schooling until the Middle Ages came along. The elaborate Roman-style education system had been all but eradicated in wider society thanks to the emergence of the Middle Ages. But school did continue, albeit only in the churches, and it was all about getting the young prepared for life after death as well as developing a healthy fear of God. Education was provided as a by- product of learning and adhering to the dominant religious ideology of the day. Things got a bit weird in these Medieval times, where learning took a back seat to some very odd ideas about the world (it was called the Dark Ages after all), and there was a lot of burning people at the stake. Remember, Galileo was executed for heresy for claiming that the world was indeed not flat and proving that the Earth revolved around the sun, which really annoyed the church who had other ideas about how the universe worked — ideas that indeed dominated schooling of the day. Despite this, universities started to develop and the sharing of knowledge started to expand. In the US in 1642, the Massachusetts Bay Colony set up one of the first compulsory schools, with many small towns following suit. Set up by religious institutions interested in furthering the word of God, many small towns were required to have a school attached to the Church so that young people could be taught Greek, Latin, and religious studies. It was not until 1918, however, that national compulsory schooling laws were enacted across the US. The idea that all children should have access to free education was in part responding to the growing needs for a literate workforce, but also as a way to prevent child labor. The evolution, devolution, and then revival of educational approaches over the last few thousand years is a fascinating read if you want to dive into more try here, here, and here (even the Wikipedia entry offers a good summary of the history of education to today). Despite the many approaches throughout history, a ‘school’ at its core is an institution for the instruction of young people that has played an important role throughout evolution, laying the foundations for the development and reinforcement of the values, ideologies, and constructs of the dominant social system of the time. Schools these days are structured around predetermined subjects and delineated by very specific chunks of time, with bells to indicate when to move, eat, and pee, all the while being rife with standardized tests and rote-learning textbooks. This is thankfully not completely universal; there are many alternatives to the mainstream system available, from creative arts schools to alternative education models like Montessori. But the dominant form of social conditioning of young people around the world is through the standard school-based education of siloed learning in age-based groups. This is not even to mention the crises of control and order unraveling in US schools, riddled with metal detectors and active shooter drills. A culture of fear is manifested in the very rooms that should be designed to deliver freedom from the oppression of fear. If you conjure up a mental image of school, you will probably have some form of tables and chairs all pointing toward a blackboard/whiteboard/smartboard and a single human instructor explaining how to do something. This format has been reinterpreted in varied ways over time around the world. In the past, the great philosophers held court with their students sitting around them, listening to them wax lyrical on existential ideas. Nowadays in most public schools in places like Australia, the United States and the United Kingdom, 30 or so kids of the same age are crammed into a room with a teacher who is often under-resourced and overworked. Where in these countries the bigger questions around school are often focused on how to get more kids to graduate, or whether or not teachers should be armed with guns (WTF!? ), perhaps instead the questions should be: Do the schools that we have designed best suit the world we are entering into? Has the old industrial form of education that our current system is based upon become obsolete? How can schools be designed to prepare young people for a changing world with increased needs for circular and systems thinking along with skills for a future that will be very different from the industrial age of the past? Make no mistake, the world has changed for the better because of education. My argument is not for the abolishment of education; globally we still have much work to do in enabling equal access to literacy and providing young people from all walks of life the opportunity to thrive. The central argument here is that in societies where school is normalized and often enforced, the way the schooling system is designed and enacted stifles the possibility of many people, while reinforcing a broader system of control and teaching young people skills for an era of the past. Right now there are many places in the world where going to school, and by extension learning to read and write, is a massive privilege, not a right. The United Nations Sustainable Development Goal Number 4 is dedicated to ensuring equitable and quality education and lifelong learning for all. Like all the SDGs, this is an ambitious and crucial objective if we are, as a species, going to progress humanity to a place where we live sustainably on the planet that we all share. Fundamentally then, school and all educative experiences must empower the learner to think freely about the complex world around them, and thus should be a liberator of oppression, not the reinforcer of it. This was echoed in the 1960s by Brazilian educator and philosopher, Paulo Freire, who wrote the renowned Pedagogy of the Oppressed. In this, Freire argues that the education system is oppressively designed as a “banker-style” system where students are viewed as empty bank accounts waiting to be filled up by the authoritative teacher who installs credits in the form of knowledge. This, in essence, reinforces oppression through the fundamental notion that the student is just waiting for instructions to conform to the predetermined status quo. One of the most shocking things about the modern schooling system is that whilst you may think that beating with canes or paddles to control wandering young minds and reinforce obedience was the common and oft-used form of discipline in the past, there are currently 69 countries, including the US and Australia, that still allow corporal punishment in schools. In general, schools today have become places where we actively discourage thinking that is not predefined, approved, and stamped by the larger social system of the day; as such, schools reinforce a reward system based on consumption, acquisition, and status increases. This, in turn, perpetuates humans being disconnected from nature and from the relationships that make up the systems around us. There are also countless studies that show the relationship between pre-existing socioeconomic positions and the ability to leverage education for life advantages (see here, here and here). Thus, this all begs the question, do modern schools actually build knowledge and capacity for all, or do they just reinforce old ideas of how industrial needs are met with a workforce? If schools are, at their fundamental level, designed to create the workers of the future, why are we still teaching siloed skills of the industrial age, when we have moved into a world that, riddled with complex problems, is in desperate need of change? Within the historical context of schooling, we can see the foundation from which the current version of education has been built upon — and how it has bred a system designed to create very controlled outcomes. This system needs to reinforce itself to survive; thus, the construction of education as being confined to a pre-constructed place (a school with other students, textbooks, and a validated teacher) is perpetuated and mimicked at length globally, without any real understanding of the personal and social implications of reinforcing a system designed this way. If schools were designed to nurture the potential and possibility of the maturing human brain, then the neurological and bio-physical reality of knowledge acquisition would be designed to maximize the experiential aspects of learning, as well as foster an ability for young people to build confidence, creative independence, and diversified thinking for active application in the world. At the very least, schools could teach relevant life skills, such as how the taxation system works or modern economic theory. The reality is that most of the things we learn in life come from the act of living — knowledge is built through the experiences and interactions we have with the world around us, not through what a rigid system of conformity that expects us to regulate to and regurgitate information from demands of us. Can you recall the content of a test you took in school? What was it on and what do you remember of it? Now, in contrast, think of a challenge you overcame as a kid, like when you learned to ride a bike or how to navigate a complex argument with a young friend. It’s much easier to recall that experience, right? It’s because experiences are the building blocks of life that you learned through interacting with the world — not from sitting in a room being told what to think. Through the construct of ‘schooling’, we have designed an environment for conditioning people to see knowledge acquisition as being directly associated with structure (through classes) and success (through grades), when in reality, most of what we learn and adopt as practices is from interacting with the world and through discovering results from trial and error. It is our experiences that form our minds and create our perceptions of the world. If you tell someone that the only way they will be successful is to conform to a system of multiple choice answers, then you teach someone to turn off their creativity, kill their curiosity, and condition them to only live within the status quo. Since Newton wrote the laws of thermodynamics, a dominant mechanical worldview has permeated education and Western societies at large. The idea that the world can be broken down into manageable bitesize parts is a particular way of approaching the infinite complexity of the world around us. It helps the human mind make sense of existence and lays out the steps of a process so that an end goal can be achieved. This mechanical worldview has resulted in the reductionst ideology that is taught in schools, which in turn, has resulted in reductionist business models, government policies, and in general, a linear, reductive view of the world. This has all helped humans become immensely successful at mass production and manufacturing, and at science and technology, which are great things that we should all be very proud of. But the natural world is not a machine, nor is the human mind (it is, after all, another emergent byproduct of the natural world). Whereas humans are thought to enjoy order and control, nature likes chaos and diversity — two things that humans have worked on systematically designing out of our modern lives, mainly through industrial education. In schools, we conform to reductionism as the dominant way of viewing the world, as we are repeatedly exposed to it from the way we learn subjects in isolation; math, science, and language, for example, are all taught in individual parts, rather than teaching the interconnectedness of science being reliant on math and that language is itself a science. Built on the past, our standard education system of today continues to be designed to suspend nonlinear thoughts and prescribe tight restrictions (and even abuse) on young people who don’t conform to the predetermined mold of what a student, and by extension, a good citizen, should be. It can even be argued that standardized testing (the foundation of most modern schools) is a form of oppression of the mind, where the student must learn to routinely conform their thinking to the rigid structure of a testing environment and ‘know’ that there is only one answer to any given problem. Interestingly, standardized tests are actually a very old method of assessing capability, with them known to have started over 2000 years ago in China. While they are useful in assessing rigidity, they fail in being able to assess creativity, critical thinking, or any form of non-linear thought — thus they are a tool for cognitive oppression, encouraging the mind to form pathways around single solutions to complex phenomena in the world. The result of this is students quickly adapt to the dominant power structures of the day and adopt the thinking structures reinforced by those with power and the other designed elements of the education system. Physical space and environment also influence the human mind immensely. The rows of seats facing the ‘knowledge’ bearer at the front of the room, the bells designed to train the body to eat and use the bathroom at specific times, the authority of hierarchy that must be respected — all of these elements ultimately prepare the person for the restrictive roles of the business world, where everyone has a boss to be feared, admired, and obeyed. The opposite view to this is systems thinking, which is the understanding that everything is made up of interdependent parts that form the complex whole. A systems worldview busts through reductionism to see that the world is made up of complex interconnected systems that impact us all, and in turn, our individual and collective actions impact these systems that provide support for life. This fundamental, biophysical reality is not taught in schools, nor is it a commonly-held knowledge or practice set in the adult population. Every system is made up of interconnected and interdependent parts. Nothing lives in isolation. Everything is interconnected, so when one views the world as things in isolation, the outcome is linear thinking — which in turn has bred a linear, reductive and wasteful economic system that maximizes losses as part of a concept of continued value extraction and creation. We have designed our minds to want simple solutions to complex problems, to avoid chaos, and to believe that we are isolated from the natural world — that we are literally ‘a part’ from, not apart of, nature. Every system must have an objective, and the designers of any system construct environments that help achieve the desired functions toward the defined end goal. A chair must allow a human to sit, a car must turn on and drive people places — core functions are embodied in everything created. Without the ability to think in systems, and appreciate the complex, interconnected, and interdependent aspects of the systems that make up the world around us, we perpetuate a worldview that limits each individual and the collective potential to solve and evolve complex problems. We’re shortchanging not just our educational experiences, but also the Earth as a whole. The magic of knowing that the future is completely undefined and that it is made up of the actions and interactions of each individual agent today (and thus each person could potentially direct the future based on the choices they make today) is lost. This type of empowered agency is exactly what the education system is seeking to design out through its mechanisms of control and order. There are many alternatives to the standard approach to knowledge transfer and social conditioning of young minds. Kolb’s work in experiential education and the cycle of learning is useful in seeing the diversity of approaches to knowledge acquisition. Pedagogical approaches that focus on experiences, like problem-based learning and participatory-action research, are designed to allow the individual to actively participate in the world around them and thus form their own thoughts, cognitive pathways, and practical experiences of a given subject or topic area. Furthermore, allowing students to learn how their brain works supports better learning. Some approaches to educational redesign include inquiry-based learning, critical pedagogy, constructivist education, and phenomenon-based learning, which is used widely in Finland, a country known around the world as having one of the top education systems. The unifying element of these approaches is that the student is not seen as a vessel needing to be filled to conform them to the status quo, but instead, a unique individual that is enabled through education to learn the foundations of reading, writing, math, language, and science and all other fields of inquiry through direct experience with phenomena in the world. Thus, students are encouraged to develop their own way of engaging with and interpreting the world around them. ‘Obedience’ is not administered through punishment, but through social cues, challenges, rewards, and reflexivity. Perhaps the best starting point for educational redesign is to focus on a life-learning model where humans are encouraged to see experience as the main provider of educative experiences, where schools are places of exploration, experimentation, and community development — as well as places that teach life skills. Teachers should be guides of the learning journey, not authoritative instructors ready to dish out abuse or punishment when the child expresses non-conforming behaviors. Learning through doing enables the learner to self-associate the new knowledge and connect the neurological dots between their own life and the world around them. Experience mixes in challenges and problem solving with criticality and teaches everyone that not getting it right the first time is OK! Fundamentally, the best thing about an experiential approach to learning is that curiosity is fostered rather than suffocated, and the learner is encouraged to develop at a speed that is relevant to their learning style. The more knowledge students have about the way their brain works, how society operates, and the magic of the natural world in which they live, the more creativity they will be able to exert throughout their lives, helping to evolve society into a place that works better than today. In short, schooling should be a universal experience where all have access to a place where education is a journey that builds skills for life, in both fostering the abilities and building the person into the best contributor to society that they can be. Educators are there to help guide the curious mind through the moral, ethical, and socially valuable aspects of our time, not to provide a rigid and reductive framework that reinforces obedience. If we don’t change the way we share knowledge and prepare young people for life, then we will continue to encounter the same problems in the world that we are grappling with today, since we will reinforce linear and reductive thinking as we go about creating the same type of thinkers that created those problems to begin with. Let’s start designing a future that works better for all of us by first designing an education system that supports the development of multi-dimensional systems thinkers who love using creative approaches to solve the complex problems that currently stifle us all. This article has acknowledged limitations. The scope has focused on Western models of education and can not cover the breadth of diversity in pedagogical experiences, with many valuable elements being omitted for argument’s sake. Also, I’m biased in writing this as the founder of an experimental knowledge lab for adults called the UnSchool of Disruptive Design and as a strong promoter of systems thinking. As an ‘educator’, I see my role as a guide to the experience of gaining new insights that lead to intrinsic changes within the human mind. Just like a vehicle requires some form of driver to get it to its destination, I see that I am getting the coordinates and steering the ship — but what happens along the way and how the participants engage with the journey is entirely up to the agents within the experience. This allows for flexibility, dynamics, and more individual and collaborative learning. While I might hold some knowledge that others would like to hold also, and I have ideas about how I can help transfer that from my brain to theirs, the entire experience is a dynamic and reciprocal relationship where the ‘educator’ and the ‘student’ (or the driver and the passenger) are working together to get to a new destination.